What Color is Your Baking Pan? When baking, you may find that your results seem quite different than those of the recipe developer. They describe a light, evenly-colored cookie but yours is light on top and dark on the bottom. Or your cake may look the right color but it is undercooked on the inside. Don’t despair. One possible fix is the type of pan you use. The color and material of the pan may not seem important, but they can have an impact on your baked goods. I have used the Williams-Sonoma Nonstick Goldtouch Pans as recommended by Cook’s Illustrated Magazine. The surface is light-colored and, unlike most non-stick bakeware, fairly scratch resistant. Regan Daley of In the Sweet Kitchen says that, “lighter-coloured non-stick pans are much more durable, as the finish is part of the material of the pan, not simply a coating.” They are nice to bake with when you need a cake to release easily for a picture-perfect treat. Because dark pans retain heat, they can help a pie baker. “Dark-colored metal pie pans … transfer heat better … (and) brown crust more quickly … However, most pie pans will brown a crust thoroughly, given enough time; (just) cover the pie’s exposed edges with a crust shield to prevent burning.” Good advice from King Arthur Flour. 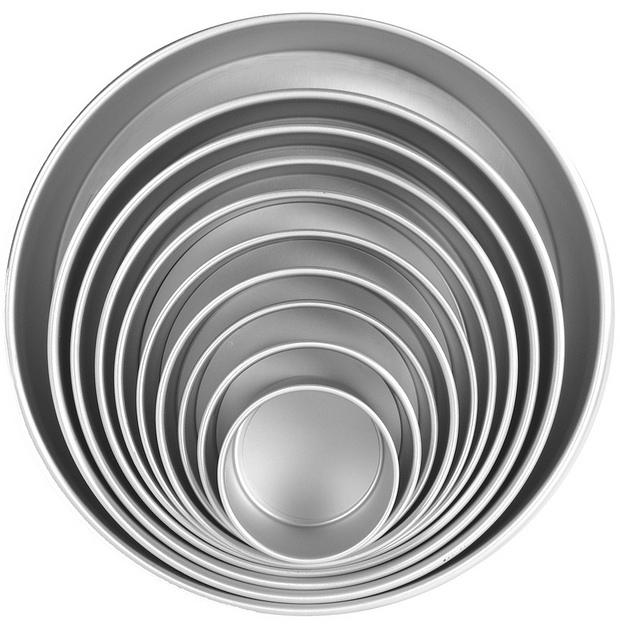 You don’t have to rush out and buy all new pans, but reread this article next time you are looking to purchase a bake pan. It’s good to be back in the kitchen. I recently moved house, but the kitchen is unpacked and I am ready to bake. To start things off with a bang, I am making cream-filled cakes. Besides, I have a specialty pan whose design is for such cakes and it needs breaking in. 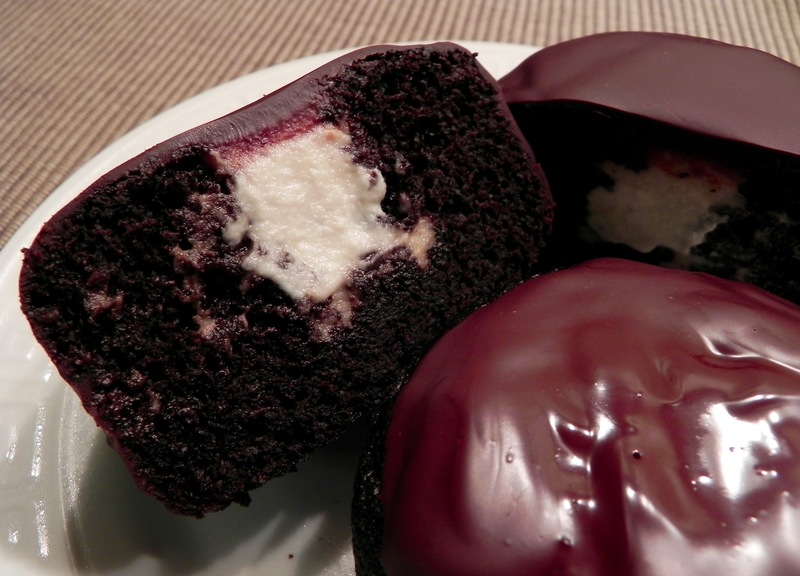 In online searches I found several recipes for homemade ‘Ding Dongs.’ I borrowed ideas from different ones and put together my decadent beauties. I chose a vegan recipe that included Black cocoa powder. It gives Ding Dongs and Oreos their signature flavor – you’ll know when you smell it. Altering for high altitude was basic – more flour, less baking powder. On a hunch I used less maple syrup so that I would get light cakes that wouldn’t get weighted down by the filling and altitude, and the hunch paid off. The filling is a cashew cream that has a step done in advance, so start there. The recipe may seem like a lot of work but the cakes are worth it. I inhaled my first one. I am now savoring my second. In a bowl, cover cashews with water and let sit for 4-8 hours. Drain completely, then combine drained cashews with 1/3 cup fresh water and blend in a high-speed blender until very smooth. Add vanilla, powdered sugar and salt and blend again. Chill in fridge. You will have leftovers you can add to smoothies or atop other baked goods. Whisk vinegar into milk and set aside for 5 minutes. Preheat oven to 325F with rack in middle of oven. Lightly coat Fat Daddio’s Choco Creme Snack Cake Pan with cooking spray. In a medium bowl, sift together flour, cocoa powders, baking powder, baking soda and salt. In a large bowl, combine all wet ingredients, including milk mixture and sugar, and beat on medium with an electric mixer. Add dry ingredients to wet in two batches, mixing as you go. Beat for a minute more. Use a scoop to fill the pan cavities 2/3 full. Bake for 17-18 minutes, until a toothpick inserted in the center comes out clean. Let cakes cool in the pan. In a double boiler, melt the chocolate. When melted, stir in coconut oil. You will need a cake decorating bag fitted with a large circle shaped tip. Fill bag with chilled filling. Poke a hole in the center of each cake with the tip making sure you don’t go all the way to the bottom. Squeeze bag to fill the center, slowly lifting bag until icing fills to the top. Wipe excess icing off the top of the cake. Place cakes on a rack with waxed paper underneath. Pour coating over each cake using a spoon to either remove excess chocolate or fill in uncoated gaps on the sides. As an alternate, you can dip just the top of each cake into the coating. Put cakes in the fridge to set the coating, about 10 minutes.